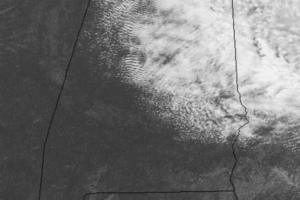 ACTIVE SPRING WEATHER: High cirrus clouds are over Alabama this afternoon; nothing on radar and temperatures are mostly in the mid to upper 70s. We note a showers and storms over Northeast Mississippi; some of those could clip the northwest corner of our state tonight, but most places will stay dry overnight. ONE MORE DRY DAY: Expect a good supply of sunshine across Alabama today with a high in the low 80s this afternoon. 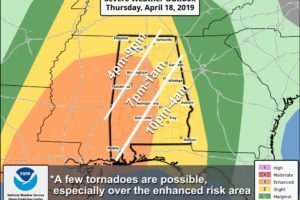 To the west we will be watching developments from Texas to the Great Lakes as severe storms are forecast to develop late today and tonight ahead of a potent weather system. 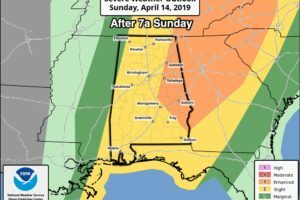 SPECTACULAR SPRING DAY: Another delightful day for Alabama; sunshine in full force this afternoon with temperatures generally between 76 and 80 degrees. The sky will stay clear tonight with a low in the 50s. ANOTHER BEAUTIFUL SPRING DAY: With a clear sky, temperatures are mostly in the 40s across Alabama early this morning. We are forecasting sunshine in fully supply today with a high between 77 and 80 degrees for most communities. Tomorrow will be mostly sunny and warm with a high in the low 80s. 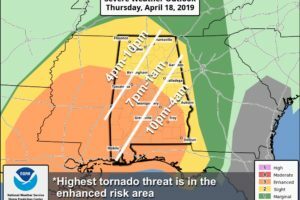 And, while we enjoy the dry, warm weather, severe storms will likely break out west of here as another dynamic storm system moves out of the western U.S. There is a risk of severe storms tomorrow afternoon and tomorrow night in a broad zone from Texas to the Midwest. SEVERE CLEAR: Nothing but sunshine across Alabama this afternoon; temperatures are generally in the 65-70 degree range. Tonight will be fair and cool with a low in the upper 40s for most communities. RADAR CHECK: A few scattered showers are over Central Alabama this afternoon, but most of the state is rain-free despite a mostly cloudy sky and a stalled front over the northwest counties. North of the front, temperatures are only in the low 60s in places like Hamilton and Haleyville, but to the south we are seeing mid to upper 70s. 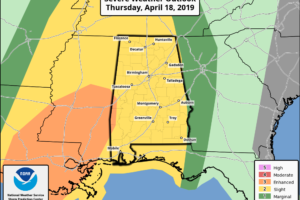 A FEW SHOWERS TODAY: A cold front is creeping into Northwest Alabama early this morning, and we have a few showers ahead of the front. 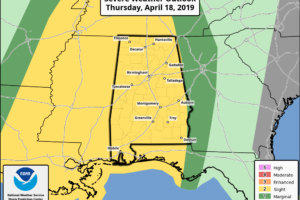 Moisture is limited, and there is little upper support, but we will maintain the chance of showers across Alabama today… otherwise the sky will be mostly cloudy with a high in the 70s. I would not call it a “rainy day”, but just be ready for a passing shower from time to time. 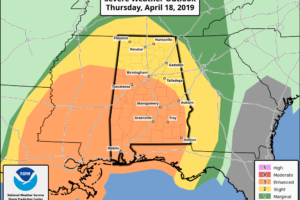 WARM IS THE WORD: Temperatures are mostly in the 81-85 degree range across Alabama this afternoon with a partly sunny sky. Clouds will increase across the state tonight ahead of a cold front. 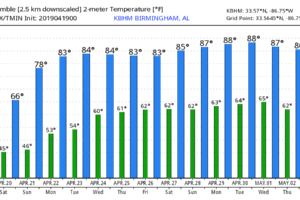 SUMMER PREVIEW CONTINUES: The high in Birmingham yesterday was 85 degrees… 12 degrees above the average high of 73, and 3 degrees shy of the record high for April 10, 88 set in 1995. Look for similar warmth today; we reach the mid 80s this afternoon with a partly sunny sky. 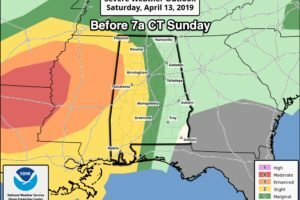 A strong south wind will develop during the day, averaging 15-25 mph with higher gusts…. a wind advisory is in effect for about the northern third of the state.